I was really craving for Eclairs for a couple of days so I went in search of an easy and good recipe so I could make them at home. Eclairs are a french chocolate pastry that are light in texture but very rich in flavour. Eclair actually means lightning in french and it was given this name because of its beautiful glaze. Not much is known about the origins of this famous pastry but its birth place is France. There are some who speculate that Eclairs were first made by a famous royal pastry chef called Marie-Antoine Carême (royal life must have been sweet with this chef around the royal kitchen!). Also oxford English Dictionary traces the term "eclair" in the English language to 1861. 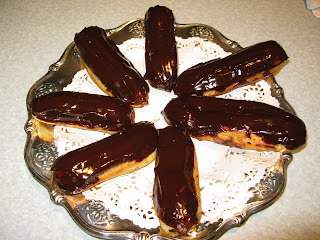 The first known recipe for eclairs appeared in the Boston Cooking School Cook Book by Mrs. D.A. Lincoln, published in 1884. Well that was a bit of culinary history for all of you who actually are interested but of course eating the eclairs is more important and fun! After some research and changing the recipe to suit what I wanted, I managed to make them and they were delicious! Very decadent dessert that takes some time to make but it is sure to impress your guests and your tummy. Here is the recipe with pictures so you can try it at home! Enjoy...I am sure you will! Preheat oven to 425°F (218 C). 1. In a pot, mix water, milk, butter, sugar, and salt. Bring to a boil. 2. Once butter has completely melted, take off flame, and slowly pour in flour, stirring constantly (sometimes this will be enough to make the dough drier and start to unstick to the sides of the pot if that happens you wont need to put it back on the flame as step 3 tells you). 3. Put pot back on flame and continue to work it with a wooden spoon. Continue stirring and kneading with spoon until the dough dries out and stops sticking to the sides of the pot. 4. Take off flame and wait a little till dough cools down (if you put the eggs when the dough is too hot it will make the eggs cook too fast and you will have some scramble eggs in your eclair dough!). Add eggs, one at a time, stirring energetically. 5. Fill a icing piping bag with the eclair batter. Butter a baking sheet. Squeeze out "finger-sized eclairs" onto baking sheet, well-spaced. This will make 20 small eclairs but if you like making them bigger please take into account that you probably will get 12 eclairs or even less. 6. Bake for 10 minutes. Then turn oven down to 385°F (196 C) and bake another 10-12 minutes with the oven door open. Now this bit is up to you to keep an eye on the progress of your eclairs, I left the oven closed for a little longer and on the last 5 minutes I opened the oven door. This is all up to your judgment and how hot your oven gets. But the oven needs to be hot so the eclairs can rise. 7. When they are done take them out of the oven and let them cool while you make the filling. 1. Add the cocoa powder and milk in a pot, and bring to light boil, remove and let it cool. 2. In a bowl, whisk yolks and sugar until it whitens. 3. Slowly add flour, stirring. 4. Slowly add chocolate milk and the coffee stirring until homogeneous. 5. Put back in pot, bring to light boil, stirring constantly, until cream thickens and becomes smooth. If your cream becomes lumpy don't panic, just add some more coffee or milk whisk it till it gets smooth again. 6. Add the liquor and while waiting it too cool off place a piece if glad rap on the top of the filling so it doesn't get a crusty. 7. When cream cools off (and eclairs have cooled off as well), you can begin filling the eclairs: Use your icing piping bag to inject the filling into the eclairs. Now be careful not to eat all of them before you put the chocolate icing on them it really pays off to wait till they are done! 1. Finely chop chocolate and place in a heatproof bowl that fits snuggly in a saucepan. 2. Once melted add butter. 3.Remove from heat and remove bowl from saucepan . Add the water and whisk thoroughly. It should look shiny and creamy! 3. 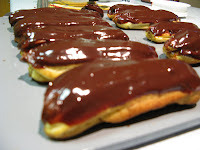 Now dip the top of your eclairs (face down of course) into the chocolate icing and place them on a tray to cool. Voilà your eclairs are ready to eat! I love to eat them cold that is why I put mine in the fridge to be nice and cool. Enjoy! Rob and I had an unexpected little outing to Canberra. He was called in for an interview and I tagged along to see if I would like to live in Canberra. For those of you who don't know, Canberra is the Capital of Australia . It was a planned city built with the purpose to become the capital just like Brasilia was built to be the capital of Brazil. I thought both cities had a lot in common even though I have not been physically to Brasilia and only know it through TV and pictures. Canberra has new architecture and is very spacious place. It has beautiful parks, natural life and the shopping is great! We had dinner in a very nice Italian restaurant which I enjoyed the chicken pasta with white wine sauce and Rob got the veal a parmigiana. For dessert we had tiramisu who was nothing else but sponge cake with cream, no hint of coffee or amaretto a real disappointment. It was very cold in Canberra (it has a ski resort near by so you can imagine that it is cold there), I was all dressed up like winter which was strange. I never expected to be so cold here in Australia for some ignorant reason I thought the whole country was warm and hot! 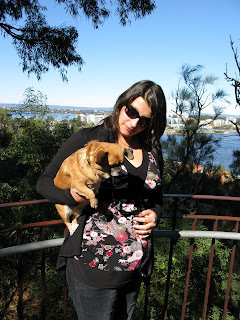 By the way we are not moving to Canberra, it wasnt that we did not like the place but with the baby on the way I wanted to be near family and friends seeing that most of my family is in Holland. 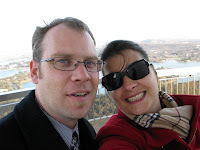 Well hope you guys enjoy the slide show with the few pictures we took while in Canberra. First of all I want to say that I am sorry for my silence regarding my blog posts. Its been a very hectic August, not only were we looking for a house (which by the way turned to be a very exhausting experience) but also Rob is looking for work. We did find a house which we liked and we are now waiting for all the paper work to be accepted. On the baby front everything is going very well. I will have my next ultrasound in a couple of weeks which of course I will post the pictures for all of you to see the little jumping bean growing into a real size baby. I still cant feel the little bugger move, even though everyone is asking me, "Have you felt it yet???". It is just a weired concept that I can feel my child move inside of me, I don't know why but I always get images of the film Alien when the thing explodes out of the chest of its host (hahahah). Oh well it is one of my favorite films...another thing that is becoming increasingly annoying is everyone turning to me and saying, "Enjoy your life now because it will be over soon." Talk about positive attitude towards starting a family, than they are surprised why women get post natal depression. Wouldn't you get depressed if the only thing you hear is that you life will be over when your child is born and when you finally popped it out, not only you need to deal with the fact that you have a tinny life to take care but also all those words of "wisdom" of people around you come to hunt you? I wish that there was a kind of law against being negative around pregnant women. Well sorry guys for all the rant on pregnancy ordeals but I needed to get it out of my chest. I am finally experiencing the happy hormones which they talk so much about. I do feel much better and also it feels like I can take the world, its a nice feeling. For the rest Perth is getting warmer and all the wild flowers are coming out to greet us. I do love spring I think its my favorite season, not too hot and all that fresh air with flowers everywhere. Last weekend was our birthday (Rob and I have birthdays on the same day) so we gathered his family and went to Kings Park for a picnic. It was a warm sunny day and all the flowers were out. I took some very nice pictures of the park and all the flowers. I hope you enjoy them. I also added in my web album pictures of the Rugby game which Rob, Julia and I went to watch. It was so fun to cheer with all the Australians and it was my first Rugby game so I had a blast! Also in the same album there is pictures of the car that we bought which Rob and I love. So I will only add the pictures of our birthday on the blog and for the other pictures please go to my web album. I will soon update the blog again, please be aware that if the house goes through we will be arranging everything to move so it might take some time for all the updates to come through. 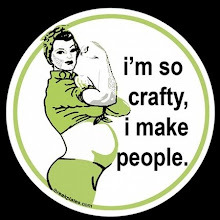 Oh I am also working on a little overalls for the baby, I already started knitting it and I already done 50% of it, will post pictures when its done. Well I hope all of you are well and enjoy the slide show.